The Jantar Mantar, Jaipur | UNIGLOBE Direct Travel Ltd. The Jantar Mantar Astronomical Observation site was built in the 18th century. A set of 20 astronomy instruments were fixed. The instruments were designed to observe astronomical positions with naked eye and embody several architectural and instrumental innovations. The Indians have always been innovative, but in the Jantar Matar observation site, they outdid themselves. 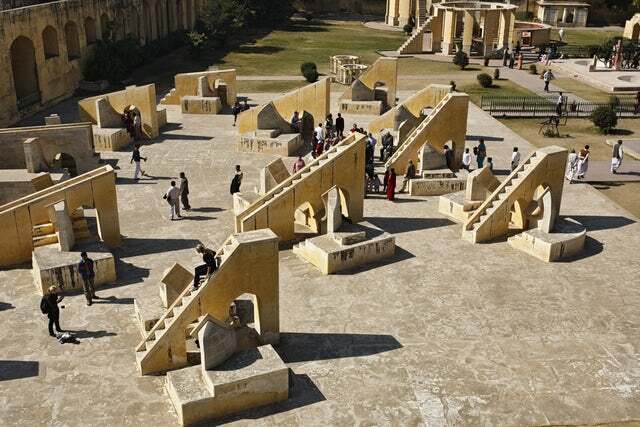 Jantar Mantar expresses the astronomical skills and cosmological concepts that were developed by the Mughal scholars. The site contains the most well-preserved monumental instruments in India. The observatory was part of the Ptolemaic tradition of observing positional astronomy that was shared by many civilizations. This type of observations helped the completion of the astronomical tables of Zij. The observatory is a monumental culmination of the Ptolemaic tradition. The impetus given to Astronomy by construction of this observatory by prince Jai Singh Ii led to the center being a meeting point of various scientists from different scientific cultures. It gave rise to the spread of social practices that were closely linked to cosmology. The site was also a symbol of royal authority given its ability for astrological forecasting. It also helped determine time, a very important factor in the urban landscape. The site embodies the blending of political, scientific and religious aspects of the ancient Mughal Empire. The average tourist will have a lot of fun exploring the observatory especially in the instrument rooms. The scientist will be amazed by the abilities of the Mughal Empire in discerning the world beyond. Amazingly, you will hardly spend more than US$100 to venture into this historical site. For a UNESCO listed World Heritage Site, you have to agree that this amount is a bargain. Make sure you bring your kids along. They may get inspired to become scientists or even astronomers. This site is where you bring a ‘lazy’ kid to inspire them to strive for greatness.